This is it - you have finally made it - WATERFRONT LIVING at its FINEST! Smell the ocean air, listen to the waves crash and watch the pelicans streamline over the sea oats bending in the wind! You'll find it all right here with this rare opportunity to own a piece of the EXCLUSIVE west end of Oak Island. 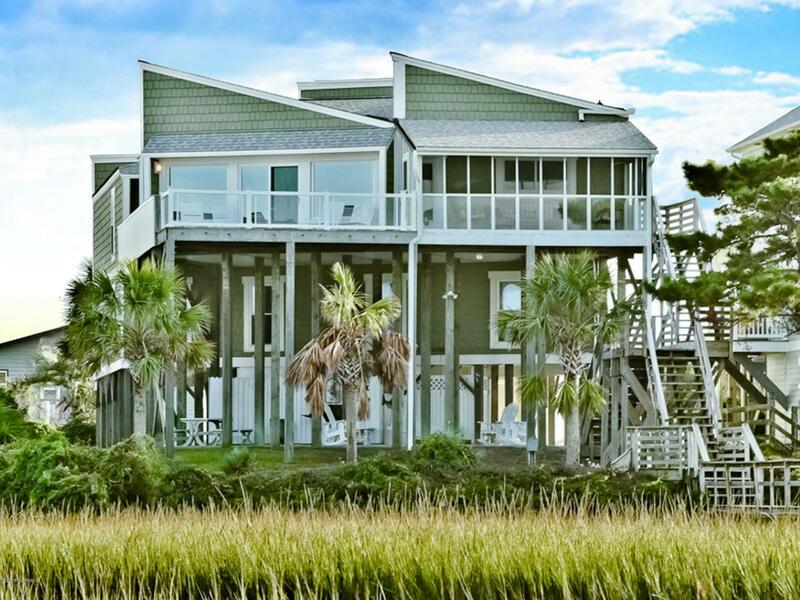 Situated on both the OCEAN & SOUND, this unique part of the Carolina coastline narrows to both oceanfront and second row with only a handful of neighbors to share the beach or the backside slough and canals with. You earned this right after all and it should be yours! Whether it is time to stroll on the beach, fish from your own private and well-lit dock with fish cleaning station, take a nice hot outside shower, ride bikes down to the Point, relax with cocktails from one of the....many open decks or screened in sunroom, lower your power boat from the 10,000 lb. 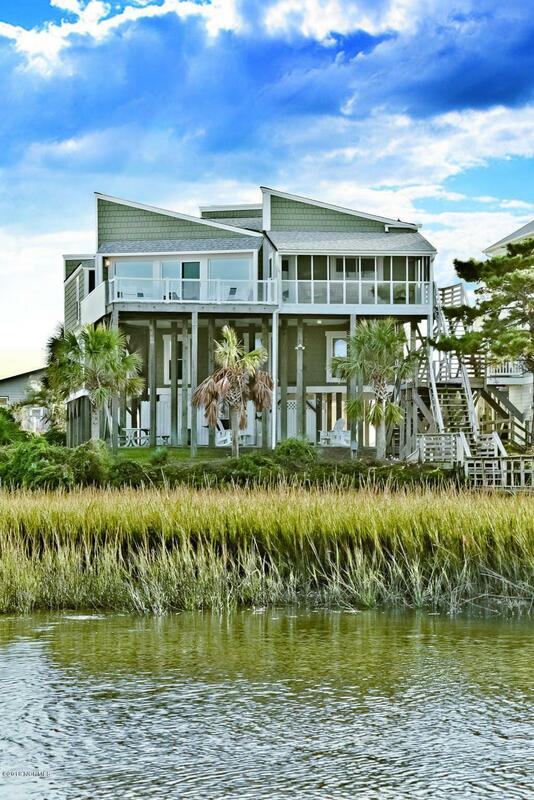 boat lift and take a quick ride to the Atlantic ocean, run your wave runners around the slough, paddle your kayaks to fish the flounder holes, or at night stroll over to the Blue Point Marina Restaurant to have a nice dinner " this LOCATION HAS IT ALL! When it's time to step inside, you can immerse yourself into more than 5,000 sq. ft. of SPECTACULAR design and craftsmanship with a blend of finishes fit for the Royal. In the MASSIVE TOP FLOOR GREAT ROOM with amazing views of the Sound, you can relax and dine for fourteen at the main dining table with family and friends, sit and talk at the bar while you play games, keep in touch with friends and send pictures of your dream spot from the media station, fire up the fireplace in the off season or head down a level to shoot some pool or play air hockey in the fully dedicated game room. This home has it all but can still be modified to a new Owner's taste and the beauty of owning 5,000+ sq. ft. on an island. Bamboo, cork, tile, berber carpet, and vinyl adorn the flooring, the enormous kitchen is fully equipped, eight barstools surround your own cold kitchen prep area, Kenmore stainless appliances, two ovens, recessed LED lighting, large pantry, granite countertops, large comfortable bedrooms and workshop below " this home has it all! Please access the Home Features under Documents for more fine details of this outstanding property and take the video ride across the slough and ocean. Now is your time to own what only a very few can say they have owned! The advantages of this home being on the slough and across the street from the ocean include lower insurance and maintenance costs and peace of mind from storm surge. Now is the time to schedule your showing today before someone else who has also earned it gets it first! Boat Slip Length 24 Ft. Listing provided courtesy of Brendan Gordon of Coastal Development & Realty Oak Island.